In this chapter you learn about the Activity class, the major building block of your app&apos;s user interface (UI). You also learn about using an Intent to communicate from one activity to another. An activity represents a single screen in your app with an interface the user can interact with. For example, an email app might have one activity that shows a list of new emails, another activity to compose an email, and another activity for reading individual messages. Your app is probably a collection of activities that you create yourself, or that you reuse from other apps. Although the activities in your app work with each other to form a cohesive user experience, each activity is independent of the others. This enables your app to start an activity in another app, and it enables other apps to start activities in your app (if your app allows this). For example, a messaging app could start an activity in a camera app to take a picture, then start an activity in an email app to let the user share the picture in email. Typically, one Activity in an app is specified as the "main" activity, for example MainActivity. The user sees the main activity when they launch the app for the first time. Each activity can start other activities to perform different actions. Each time a new activity starts, the previous activity is stopped, but the system preserves the activity in a stack (the "back stack"). When the user is done with the current activity and presses the Back button, the activity is popped from the stack and destroyed, and the previous activity resumes. When an activity is stopped because a new activity starts, the first activity is notified by way of the activity lifecycle callback methods. The activity lifecycle is the set of states an Activity can be in: when the activity is first created, when it&apos;s stopped or resumed, and when the system destroys it. You learn more about the activity lifecycle in a later chapter. Implement a basic UI for the Activity in an XML layout file. Declare the new Activity in the AndroidManifest.xml file. When you create a new project for your app, or add a new Activity to your app by choosing File > New > Activity, the template automatically performs the steps listed above. When you create a new project in Android Studio and choose the Backwards Compatibility (AppCompat) option, the MainActivity is, by default, a subclass of the AppCompatActivity class. 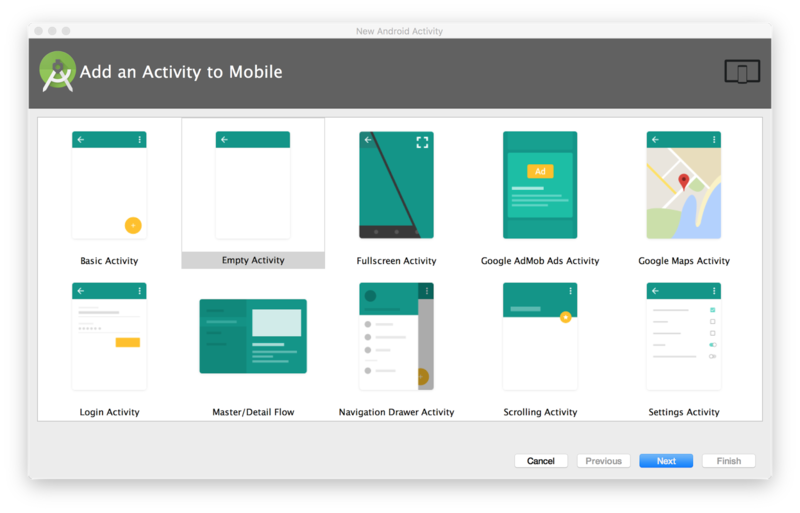 The AppCompatActivity class lets you use up-to-date Android app features such as the app bar and Material Design, while still enabling your app to be compatible with devices running older versions of Android. The first task for you in your Activity subclass is to implement the standard Activity lifecycle callback methods (such as onCreate()) to handle the state changes for your Activity. These state changes include things such as when the Activity is created, stopped, resumed, or destroyed. You learn more about the Activity lifecycle and lifecycle callbacks in a different chapter. You typically define the UI for your Activity in one or more XML layout files. When the setContentView() method is called with the path to a layout file, the system creates all the initial views from the specified layout and adds them to your Activity. This is often referred to as inflating the layout. You may often also want to implement the onPause() method in your Activity. The system calls this method as the first indication that the user is leaving your Activity (though it does not always mean that the Activity is being destroyed). This is usually where you should commit any changes that should be persisted beyond the current user session (because the user might not come back). You learn more about onPause() and all the other lifecycle callbacks in a later chapter. The UI for an activity is provided by a hierarchy of View elements, which controls a particular space within the activity window and can respond to user interaction. The most common way to define a UI using View elements is with an XML layout file stored as part of your app&apos;s resources. Defining your layout in XML enables you to maintain the design of your UI separately from the source code that defines the activity behavior. You can also create new View elements directly in your activity code by inserting new View objects into a ViewGroup, and then passing the root ViewGroup to setContentView(). After your layout has been inflated—regardless of its source—you can add more View elements anywhere in the View hierarchy. The <activity> element includes a number of attributes to define properties of the Activity such as its label, icon, or theme. The only required attribute is android:name, which specifies the class name for the Activity (such as MainActivity). See the <activity> element reference for more information on Activity declarations. The <activity> element can also include declarations for Intent filters. The Intent filters specify the kind of Intent your Activity will accept. Intent filters must include at least one <action> element, and can also include a <category> and optional <data>. The MainActivity for your app needs an Intent filter that defines the "main" action and the "launcher" category so that the system can launch your app. Android Studio creates this Intent filter for the MainActivity in your project. The <action> element specifies that this is the "main" entry point to the app. The <category> element specifies that this Activity should be listed in the system&apos;s app launcher (to allow users to launch this Activity). Each Activity in your app can also declare Intent filters, but only your MainActivity should include the "main" action. You learn more about how to use an implicit Intent and Intent filters in a later section. The MainActivity for your app and its associated layout file is supplied by an Activity template in Android Studio such as Empty Activity or Basic Activity. You can add a new Activity to your project by choosing File > New > Activity. Choose the Activity template you want to use, or open the Gallery to see all the available templates. A Java file for the new Activity with a skeleton class definition and onCreate() method. The new Activity, like MainActivity, is a subclass of AppCompatActivity. An additional <activity> element in the AndroidManifest.xml file that specifies the new activity. The second Activity definition does not include any Intent filters. If you plan to use this activity only within your app (and not enable that activity to be started by any other app), you do not need to add filters. Each activity is started or activated with an Intent, which is a message object that makes a request to the Android runtime to start an activity or other app component in your app or in some other app. When your app is first started from the device home screen, the Android runtime sends an Intent to your app to start your app&apos;s main activity (the one defined with the MAIN action and the LAUNCHER category in the AndroidManifest.xml file). To start another activity in your app, or to request that some other activity available on the device perform an action, you build your own intent and call the startActivity() method to send the intent. In addition to starting an activity, an intent can also be used to pass data between one activity and another. When you create an intent to start a new activity, you can include information about the data you want that new activity to operate on. So, for example, an email Activity that displays a list of messages can send an Intent to the Activity that displays that message. The display activity needs data about the message to display, and you can include that data in the intent. In this chapter you learn about using intents with activities, but intents can also be used to start services or broadcast receivers. You learn how to use those app components in another practical. Explicit intent: You specify the receiving activity (or other component) using the activity&apos;s fully qualified class name. You use explicit intents to start components in your own app (for example, to move between screens in the UI), because you already know the package and class name of that component. Implicit intent: You do not specify a specific activity or other component to receive the intent. Instead, you declare a general action to perform, and the Android system matches your request to an activity or other component that can handle the requested action. You learn more about using implicit intents in another practical. The Activity class (for an explicit Intent). This is the class name of the Activity or other component that should receive the Intent; for example, com.example.SampleActivity.class. Use the Intent constructor or the setComponent(), setComponentName(), or setClassName() methods to specify the class. The Intent data. The Intent data field contains a reference to the data you want the receiving Activity to operate on as a Uri object. For an implicit Intent, you may need to also define the Intent action and category. You learn more about Intent actions and categories in another chapter. To start a specific Activity from another Activity, use an explicit Intent and the startActivity() method. An explicit Intent includes the fully qualified class name for the Activity or other component in the Intent object. All the other Intent fields are optional, and null by default. An application context. In this example, the Activity class provides the context (this). In addition to simply starting one Activity from another Activity, you also use an Intent to pass information from one Activity to another. The Intent object you use to start an Activity can include Intent data (the URI of an object to act on), or Intent extras, which are bits of additional data the Activity might need. You can use either Intent data or Intent extras to pass data from one Activity to another. There are several key differences between data and extras that determine which you should use. The Intent data can hold only one piece of information: a URI representing the location of the data you want to operate on. That URI could be a web page URL (http://), a telephone number (tel://), a geographic location (geo://) or any other custom URI you define. Intent extras are for any other arbitrary data you want to pass to the started Activity. Intent extras are stored in a Bundle object as key and value pairs. A Bundle is a map, optimized for Android, in which a key is a string, and a value can be any primitive or object type (objects must implement the Parcelable interface). To put data into the Intent extras you can use any of the Intent class putExtra() methods, or create your own Bundle and put it into the Intent with putExtras(). The Intent class includes extra keys you can use, defined as constants that begin with the word EXTRA_. For example, you could use Intent.EXTRA_EMAIL to indicate an array of email addresses (as strings), or Intent.EXTRA_REFERRER to specify information about the originating Activity that sent the Intent. You learn about each of these steps in the following sections. The request code is an integer that identifies the request and can be used to differentiate between results when you process the return data. For example, if you launch one Activity to take a photo and another to pick a photo from a gallery, you need different request codes to identify which request the returned data belongs to. The response data from the launched Activity back to the originating Activity is sent in an Intent, either in the data or the extras. You construct this return Intent and put the data into it in much the same way you do for the sending Intent. Typically your launched Activity will have an onClick() or other user input callback method in which you process the user&apos;s action and close the Activity. This is also where you construct the response. A return result Intent does not need a class or component name to end up in the right place. The Android system directs the response back to the originating Activity for you. Then put your return data into the Intent as usual. In the following, the return message is an Intent extra with the key EXTRA_RETURN_MESSAGE. RESULT_OK: The request was successful. RESULT_CANCELED: The user canceled the operation. RESULT_FIRST_USER: For defining your own result codes. You use the result code in the originating Activity. The three arguments to onActivityResult() contain all the information you need to handle the return data. Request code: The request code you set when you launched the Activity with startActivityForResult(). If you launch a different Activity to accomplish different operations, use this code to identify the specific data you&apos;re getting back. Intent data: the Intent that contains the data returned from the launch Activity. Any app of any complexity that you build will include more than one Activity. As your users move around your app and from one Activity to another, consistent navigation becomes more important to the app&apos;s user experience. Few things frustrate users more than basic navigation that behaves in inconsistent and unexpected ways. Thoughtfully designing your app&apos;s navigation will make using your app predictable and reliable for your users. Back (temporal) navigation, provided by the device Back button, and the back stack. Up (ancestral) navigation, provided by you as an option in the app bar. The back stack is the set of each Activity that the user has visited and that can be returned to by the user with the back button. Each time a new Activity starts, it is pushed onto the back stack and takes user focus. The previous Activity is stopped but is still available in the back stack. The back stack operates on a "last in, first out" mechanism, so when the user is done with the current Activity and presses the Back button, that Activity is popped from the stack (and destroyed) and the previous Activity resumes. Because an app can start an Activity both inside and outside a single app, the back stack contains each Activity that has been launched by the user in reverse order. Each time the user presses the Back button, each Activity in the stack is popped off to reveal the previous one, until the user returns to the Home screen. 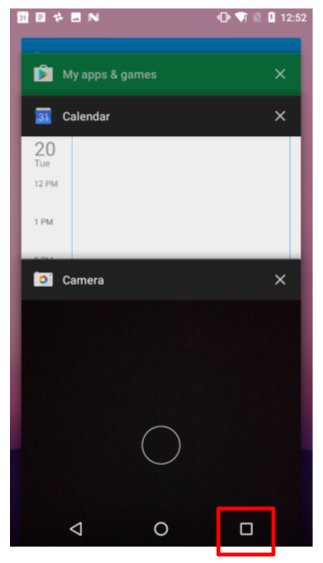 Android provides a back stack for each task. A task is an organizing concept for each Activity the user interacts with when performing an operation, whether they are inside your app or across multiple apps. Most tasks start from the Android home screen, and tapping an app icon starts a task (and a new back stack) for that app. If the user uses an app for a while, taps home, and starts a new app, that new app launches in its own task and has its own back stack. If the user returns to the first app, that first task&apos;s back stack returns. Navigating with the Back button returns only to the Activity in the current task, not for all tasks running on the device. Android enables the user to navigate between tasks with the overview or recent tasks screen, accessible with the square button on lower right corner of the device . There may, however, be times where you may want to override the default behavior for tasks or for the back stack. For example, if your screen contains an embedded web browser where users can navigate between web pages, you may wish to use the browser&apos;s default back behavior when users press the device&apos;s Back button, rather than returning to the previous Activity. You may also need to change the default behavior for your app in other special cases such as with notifications or widgets, where an Activity deep within your app may be launched as its own task, with no back stack at all. You learn more about managing tasks and the back stack in a later section. 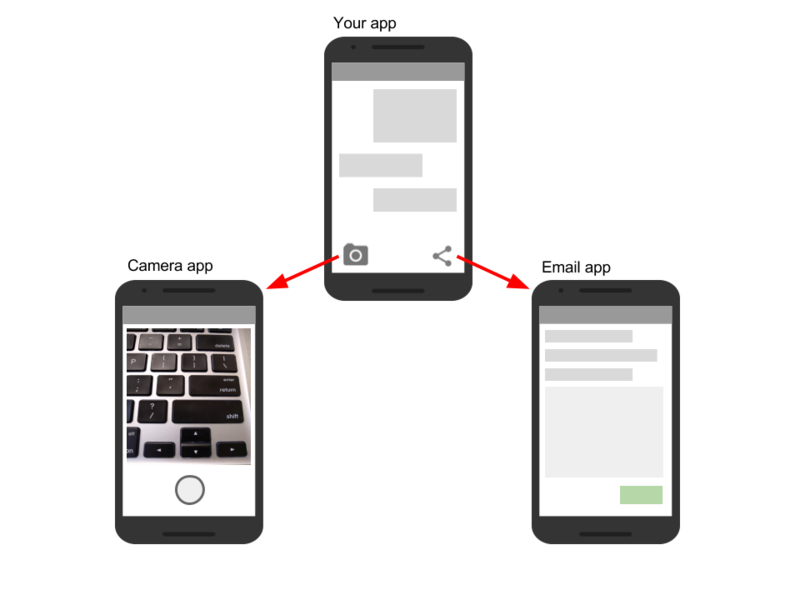 Up navigation, sometimes referred to as ancestral or logical navigation, is used to navigate within an app based on the explicit hierarchical relationships between screens. With Up navigation, each Activity is arranged in a hierarchy, and each "child" Activity shows a left-facing arrow in the app bar that returns the user to the "parent" Activity. The topmost Activity in the hierarchy is usually MainActivity, and the user cannot go up from there. The behavior of the Up button is defined by you in each Activity based on how you design your app&apos;s navigation. In many cases, Up and Back navigation may provide the same behavior: to just return to the previous Activity. For example, a Settings Activity may be available from any Activity in your app, so "up" is the same as back—just return the user to their previous place in the hierarchy. Providing Up behavior for your app is optional, but a good design practice, to provide consistent navigation for your app. With the standard template projects in Android Studio, it&apos;s straightforward to implement Up navigation. If one Activity is a child of another Activity in your app&apos;s Activity hierarchy, specify the parent of that other Activity in the AndroidManifest.xml file. You learn more about Up navigation and other user navigation features in another practical. The related practical is 2.1: Activities and intents.